This is the Vanessa Megan "Trademark Scent". The Essential Blend perfume includes a unique combination of the five essential oils Ylang Ylang, Patchouli, Lavender, Rose and Geranium. Together these are known to calm the mind, relax the body, balance the hormonal system and provide aphrodisiac benefits. In addition to using this as a perfume on the body it can also be sprayed onto linen and clothing. Avoid if pregnant. Due to Customs and Postal regulations, we are unable to send this product overseas outside of Australia. 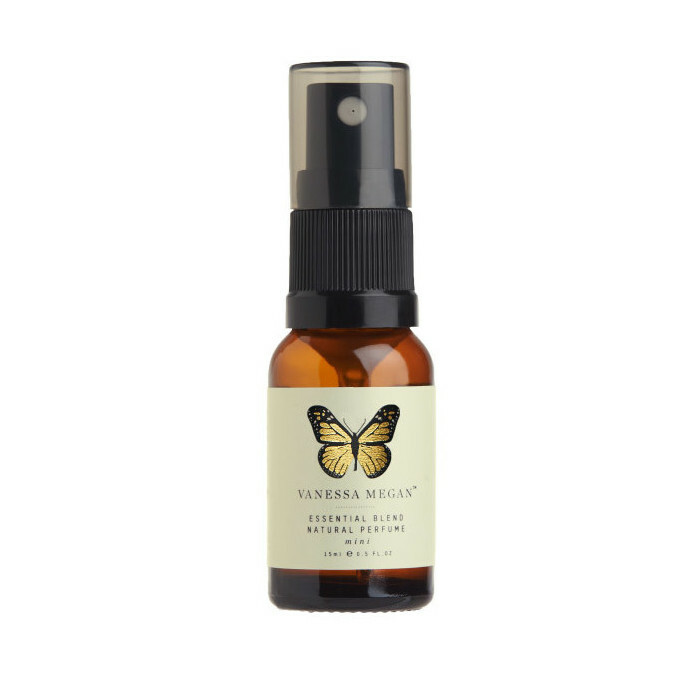 Shake well and spray directly onto the skin, avoiding face and eyes. I really like this one. The bottle has lasted me a long time however that is probably due to the fact that the spray nozzle seems to get clogged every few days and I have to clean it out. I do find the smell dissipates quickly.. but the scent is lovely. Not sure if I’ll purchase again. kind of smells like musk stick lollies a bit which is odd, but once you get past that it's pretty nice. sample size is great to throw in bag and for travelling. would purchase again.